Here we go again – it’s yet another rip-off by another up-and-coming Chinese carmaker, Shanghai-based Youxia Motors. 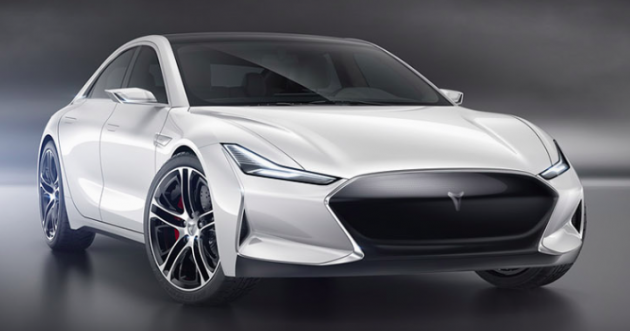 The Youxia X is basically a copy-and-paste job, with the Tesla Model S as its foundation. So far, there has been no official response from Tesla regarding this product launch, and it’ll be interesting to hear what Elon Musk thinks about all of this. Much like the furore over the Landwind X7, this way of doing business is pretty much accepted in China. Nonetheless, the Youxia X does look quite nice, actually. According to reports, its powered by a 348 hp electric motor and has an operating system that is based on Google Android 5.0 that will be compatible with Apple and Android devices. Interestingly, the car’s designer, Huang Xiuyuan, is a big-time Knight Rider fan, and the operating system for the car is called KITT OS. Even the car’s name, Youxia X, is based on the localised name of the 80’s American TV show. What’s more, there is a holographic grille that can interchange between Knight Rider style running lights, the Youxia logo or whatever else that takes your fancy. At this rate, it may be time for Youxia Motors to get David Hasselhoff as its official brand ambassador. Anyhow, the vehicle also has a built in WiFi hotspot, and the car’s electronics can be controlled remotely. It even has a real attention-grabbing fad, which allows the driver to pipe in a list of car engine sounds through the speakers, with sound options that include the Ferrari 488 GTB, La Ferrari and the Jaguar F-Type. Whether these sounds are officially licensed or not, remains to be seen. According to CarNewsChina, the makers claim that the X can do the century sprint in 5.6 seconds. The official photo cites 0-60 km in 2.8 seconds, but we assume it’s 60 km/h. It will come with the option of a 40 kWh, 60 kWh or 85 kWh battery, each with claimed ranges of 220 km, 330 km and 460 km, respectively. It is said that a full charge for the battery will only take half an hour at a Supercharger station. Speculation is rife about the pricing, and it may be priced around $32,000 to $48,000 (RM122,000 to RM183,000) with customers getting a $14,000 (RM53,400) subsidy from the government with every purchase. The production of the Youxia X is slated towards the end of 2016. Yea, NASA send rocket to moon, they are doing so, while we can send a doctor into space doing stupid things like making roti canai. The chinese has EV now, where is our Proton Hybrid? Still testing on the Mars? then go buy your own people product la..see people laugh at you! Kalo tak suka keluar loh… boikot. Gtfo from this page since a Chinese man founded it. hypocrite a-*ole…eat your own chinese poison! Copying is in the human DNA, almost every business in world started out copying somebody else design or reworking some known design or technology. The Japan and the Korean also built their car industry initially by copying. So did the car in Europe and US when they first started. And it is duplication that drive innovation. Companies that spend their time going to court seldom innovates. not to worry, the battery technology is from Tesla. Design wise, this is a better effort than the Landwind X7. The overall looks and specs are pretty impressive to be honest. cant blame the chinese. tesla open their patents to public. This actually looks better than the Tesla Model S! Must be lots of clone parts in it…scary thing is the battery gonna easily explode ! A matter of fact, the batteries dun explode, catch fire maybe as what happened to a few Teslas. There were several cases of the Ferrari 458 catching fire as well. But in general, you get what you pay for, China produces both high quality and low quality product to your budget. And most continental cars have high quality finish but poor reliabilty so just because its Chinese it isn’t all bad and neither are western product all good. Well, since last year June, Tesla decided that “Tesla will not initiate patent lawsuits against anyone who, in good faith, wants to use their technology.” Tesla wanted chinese makers to further improve their technology hence more EV producers to compete with their common enemy, the gasoline counterpart. Is it available in the Malaysian market?. Since Tesla won’t be available here. Don’t care if it’s China brand. So long it’s a good car who cares.. Looked awesome to me. Well you won’t get to see its rear anyway. like you can catch up with this car.